Venipuncture (also called venepuncture or venopuncture), is an invasive procedure of obtaining access to a vein. The purpose is to drawing a sample of venous blood or for administering drugs or fluids via intravenous therapy. there are a number of health care professionals and researchers trained to perform this procedure including doctors, nurses, phlebotomists, paramedics, dialysis and laboratory technicians. 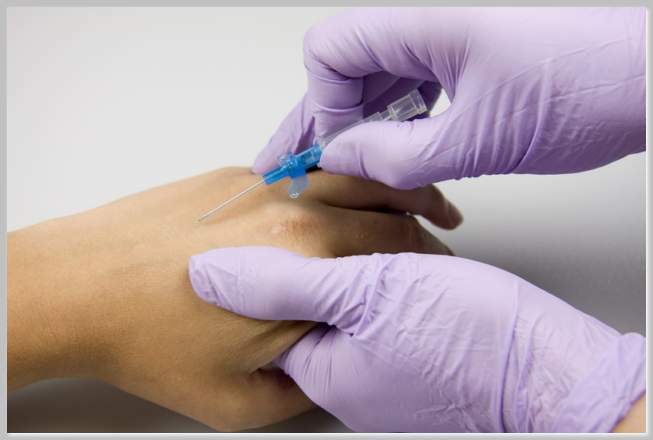 Venipuncture is a procedure that involves the extraction of blood from a vein making use of a syringe and a needle. This is done when the doctor wants to determine the levels of certain substances in blood to arrive at a correct diagnosis. It is an invasive procedure but the pain is tolerable when done by an expert. The most common site of puncture is the ante-cubital fossa which is composed of three veins, the cubital, basilic and the median cephalic. Blood extraction could be performed in veins that meet the criteria. 1. Be sure to identify the patient correctly. The reliability of results does not only concern the performance of the test but all processes involved with the test. This starts with patient identification. Ask the patient to state his name or to write it down. Make sure you got all your data entries correct including the complete name of the patient. There are people who have similar names so obtaining the middle name would be useful to solve such problems. 2. Know the tests required before commencing with the venipuncture as this would determine the type of blood specimen to collect and the manner of collection. i.e. anaerobic, for blood gas analysis (BGA), etc. 3. The site to be punctured should be free from hematoma and edema. 4. Proper sterilization procedures should be done before puncturing the vein, preferably a circular motion starting from the site of puncture going outwards. This is to minimize contamination of the site of puncture. 5. Do not puncture in the same vein that an IV fluid is inserted as the components of the IV fluid would contaminate your specimen. If you don’t have any alternative, then collect your sample below the IV fluid. 6. Check that your syringe is not clogged by pulling and pushing the plunger. If it operates smoothly, then it could be used. Check also your needle of any factory defect. Do not; however, open the pack, not until you’re ready to puncture as this may lead to contamination. 7. Select a vein that is not too think or too thin. A good vein does not roll when punctured and is not too thin. Choose a vein that is palpable and visible to facilitate collection. If you don’t have any choice, then opt for the most visible vein. 8. Never extract blood when the patient is in a standing position. Allow the patient to sit down or lie down in a comfortable position. 9. If physical exertion is not contraindicated with the substance tested, then you can let the patient open and close his fist to make his veins prominent. 10. Allow the alcohol to dry before puncturing. Inserting the needle while the wet would be painful. 11. The tourniquet should be released first before the needle. This is to avoid bleeding of patients who have clotting disorders. 12. The bevel should be facing upwards to allow the smooth flow of blood into the barrel of the syringe. 13. When blood starts to flow into the barrel, the plunger should not be pulled too fast to avoid collapse of the veins. It should also not be too slow to avoid clotting before you could transfer the blood to an appropriate container. 14. Transfer the blood immediately after extraction to an anti-coagulated tube if you want plasma and to a plain tube if you want serum. You could also make use of vacutainer tubes to facilitate extraction and preservation of blood. Being aware of these precautions would make you more skilled in venipuncture procedures. Do not attempt to extract if you don’t have any formal or hands-on training because venipuncture is a skill that should be perfected.